As it turned out, no reporters ever asked about the foam strike. But the wording of the email gave commander Rick Husband and pilot William "Willie" McCool no reason to question the conclusion that Columbia was in no danger. And indeed, the commander replied in a light-hearted manner, even making a small play on words and ending an email with a "smiley" - :) - face. 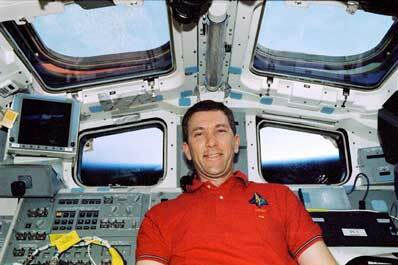 Husband replied to flight director Steve Stich the following day - Jan. 24 - saying "Thanks a million Steve!" "And thanks for the great work on your part AND for the great poems!" Husband emailed. "I saw the word Chine below and thought it was "China". I guess it's believeable (sic) that you might meet someone from China by the name of Main Wing :)." Mission control uplinked a video of the foam strike Jan. 25 and Husband replied the next day, saying only "thanks for the super work! We appreciate it." In hindsight, the emails are disturbing because of the remarkably casual manner in which the foam strike, the worst in shuttle history, was dismissed. Other emails that were released after Columbia's Feb. 1 destruction showed mid-level engineers were concerned about potentially severe re-entry damage all the way until the day before landing. The Columbia Accident Investigation Board now believes the foam strike is the most probable cause of the Columbia disaster. Eighty-one seconds after Columbia's launching, a suitcase-size chunk of foam insulation broke away from the shuttle's external fuel tank and slammed into the leading edge of the ship's left wing. The foam strike was discovered during routine post-launch video analysis on Jan. 17. Mission managers promptly ordered an engineering assessment to determine whether or not Columbia's heat-shield tiles had been damaged enough to compromise safety during re-entry. An analysis carried out by Boeing concluded that while possibly severe heat damage to the underlying skin might require post-landing repairs, the impact did not pose a "safety of flight" issue. The analysis indicated any impact on the reinforced carbon carbon leading edge panels would do little more than mar the coating. As it turned out, the analysis was deeply flawed. The engineers extrapolated from an earlier tile-impact study involving much smaller pieces of debris and had virtually no data at all regarding how such strikes might affect RCC panels. Post-accident analyses, impact tests using a nitrogen gas cannon, enhanced launch video and sensor data all indicated the 1.67-pound chunk of foam, which hit the leading edge at more than 500 mph, caused a breach that allowed super-heated air to burn its way inside during Columbia's re-entry Feb. 1. The wing ultimately failed and Columbia was destroyed. But NASA's mission management team accepted the results of the Boeing analysis, quashed efforts to obtain spy satellite photography that might have resolved the issue one way or the other and informed the crew about the impact only in passing. But according to a just-released transcript of internal mission control communications loops, the foam strike, or a debris impact of some sort, clearly was on the minds of re-entry flight controllers when the first signs of trouble developed. Mechanical systems officer Jeffrey Kling - MMACS - was the man who first informed flight director Leroy Cain about unusual telemetry from Columbia's left wing. Kling, in turn, was backed up by other mechanical systems, or MECH, engineers, including Ken Smith and David Lechner, in a nearby support room. "What in the world?" one of the MECH engineers wondered when the first sensor data dropped off line. "This is not funny," Kling replied. "On the left side." "On the left side," MECH agreed. Seconds later, at 08:54:24 a.m., Kling informed Cain. "FYI, I've just lost four separate temperature transducers on the left side of the vehicle, hydraulic return temperatures. Two of them on system one and one in each of systems two and three. To the left outboard and left inboard elevon." Columbia was passing over the California-Nevada state line at 22.5 times the speed of sound at an altitude of 227,400 feet. Seconds later, observers on the ground noticed a bright flash in the shuttle's plasma trail followed by the sixth known incident of debris falling away from the orbiter. Kling's discussion with Cain has been posted previously, but the internal dialogue between Kling and the MECH officers sheds a chilling new light on the events of Feb. 1. "OK, is there anything common to them? DSC (discrete signal conditioner) or MDM (multiplexer-demultiplexer) or anything?" Cain wondered. "I mean, you're telling me you lost them all at exactly the same time?" "No, not exactly," Kling replied. "They were within probably four or five seconds of each other." "OK, where are those, where is that instrumentation located?" "All four of them are located in the aft part of the left wing, right in front of the elevons, elevon actuators. And there is no commonality." "No commonality," Cain said slowly. He said later the foam strike was the first thing he thought of when he heard Kling's initial report. Kling then spoke to his support room, saying "OK. Keep an eye on the left side. Everything else... looks like the rest of the temperatures are good." After answering another question from Cain about the systems involved, Kling continued his discussion with the MECH officers, struggling to figure out what might be going on. He apparently was thinking back to the foam strike on the left wing. "Those are really spread too far apart to be pickin' up... like debris damage or anything to both of em', unless they cut a big swath... have to be two hits," Kling speculated. "And MMACS, FLIGHT," Cain called. "All other indications for your hydraulic system indications are good?" "They're all good," Kling said. "We've got good quantities all the way across." "And the other temps are normal?" "The other temps are normal, yes sir." "And when you say you lost these, are you saying that they went..."
"All four of them are off-scale-low," Kling replied. "... to zero or off-scale-low?" Cain continued. "And they were all staggered, they were, like I said, within several seconds of each other," Kling relayed to Cain. "OK," the flight director said. It was 8:58 a.m. Kling then resumed the conversation with MECH. "All the rest of the telemetry as we can see is still looking good." But not for long. At 8:58:48 a.m., Husband called down from Columbia, saying "And, uh, Hou(ston)," but his transmission was cut off. Seconds later, at 8:59:15 a.m., Kling called Cain with more alarming news. "We just lost tire pressure on the left outboard and left inboard, both tires." Husband presumably was calling down to note the main landing gear tire pressure readings. Astronaut Charles Hobaugh, listening in on the flight control audio loop, promptly radioed Columbia to confirm the ground had, in fact, seen the tire data. "And Columbia, Houston, we see your tire pressure messages and we did not..."
"Is it instrumentation, MMACS? Gotta be..." Cain said. "FLIGHT, MMACS. Those are also off, off-scale low," Kling said. Then, speaking again to MECH, he added "I am not believing this." Seconds later, Columbia broke apart above central Texas.